'Girls Trip’s' Regina Hall and 'Black-ish’s' Marsai Martin both star as Jordan Sanders — Hall as the take-no-prisoners tech mogul adult version of Jordan, and Martin as the 13-year-old version of her who wakes up in her adult self’s penthouse just before a do-or-die presentation. 'Insecure’s' Issa Rae plays Jordan’s long-suffering assistant April, the only one in on the secret that her daily tormentor is now trapped in an awkward tween body just as everything is on the line. 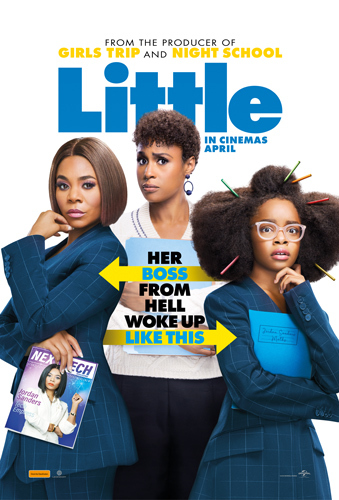 'Little' is an irreverent new comedy about the price of success, the power of sisterhood and having a second chance to grow up - and glow up - right. Will Packer, blockbuster producer of 'Girls Trip', the 'Ride Along' franchise, 'Night School', 'No Good Deed' and 'Think Like a Man', brings an all new perspective to the body swap comedy. The 'Little' competition has now closed. Winners will be announced shortly. Competition opens at 5pm AEDT on Sunday 31st March 2019 and closes at 11:59pm AEDT on Sunday 7th April 2019. Five winners will be chosen at random on Monday 8th April 2019. To successfully win, entrants must fulfil the above entry conditions before the time the competition closes. Current members/followers are eligible to enter the competition. Only one entry per person. Only one winner per household. To be a valid winner, the entrant must not have won a prize from SWITCH within the last 28 days. Each winner will receive one double pass to 'Little'. By entering, you agree to receive occasional emails from SWITCH in the future. If you decide to unsubscribe from these updates, any further entries will not be applicable. Only Australian residents are eligible to enter. 'Little' is in cinemas from Thursday the 11th April 2019. © 2019 Universal Studios.